Paintings & Stories: 19. Brighten up your snow day, Chicagoans! 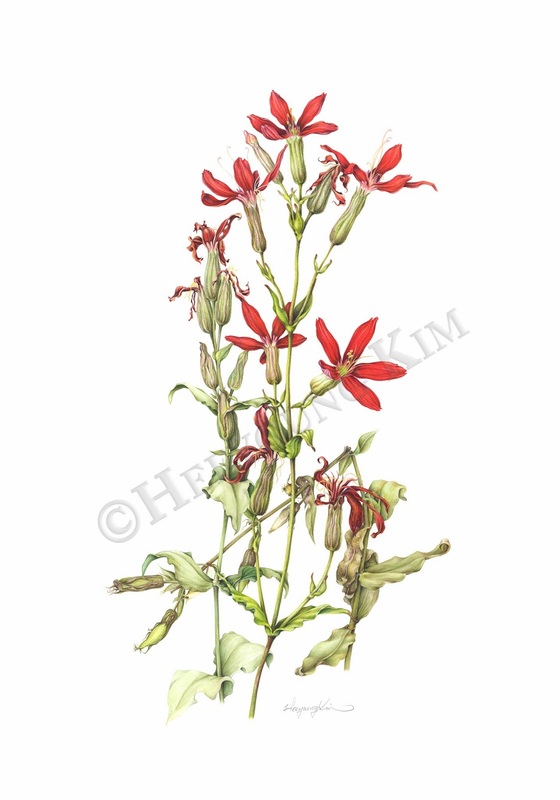 "Red is rare on the prairie, and the Royal Catchfly wears its crimson blossoms well. It is a dangerous beauty for climbing insects unfortunate enough to be caught in the sticky hairs that line the base of the flower, but its nectar is a favorite treat of butterflies and hummingbirds. ........."
Red flowers make us happy! Well, not only us, humans, but also butterflies and humming birds! This winter in Chicago and broader area, we have extraordinary amount of snow. Long icy and snowy spell has made me feel not so happy. So I dug up this old image, hoping that it might brighten up me, and other people. 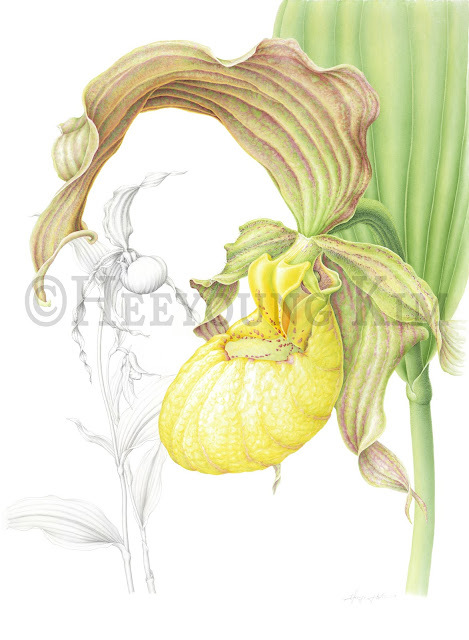 I started to paint this rare beauty in 2007, the same year I started to learn botanical art, and finished in the next summer after I saw the plants in bloom once again. This painting screamed loudly enough to catch all the attention from the public and media. So it brought me a huge luck by being shown up on sign boards and invitation card. 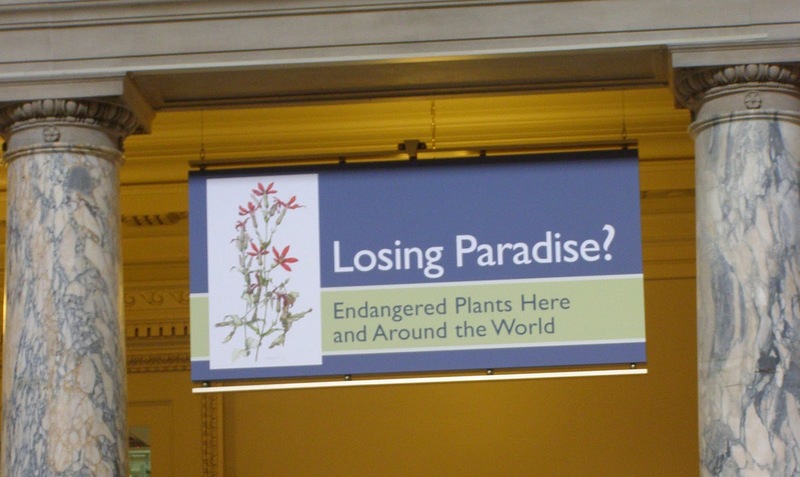 Most of all, I am very happy that my painting played its role to draw attention to plant conservation issue through Losing Paradise exhibition in four botanic gardens in US and Smithsonian Natural History Museum. 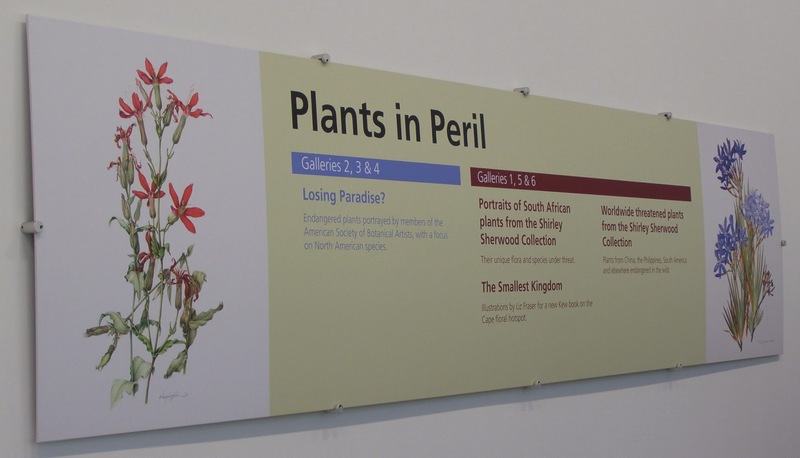 Finally the exhibition was shown to broader public at Shirley Sherwood Gallery in Royal Botanic Garden KEW, London. This painting is not in my possession any more, but it always remains as an inspiration for my prairie plant painting project. It also remains on Smithsonian website exhibition page ever since the show was there. I am so pleased to see someone else wants to see it for long. i am really excited to grow up my own garden one day where i could peaceful read and sip my tea. and i regularly follow this blog to get all the infor i can get to do that. keep posting!